When Londa traveled to Uruguay on a mission trip earlier this year, she didn’t know how many children her group would be able to share the Gospel with. To their surprise, they met nearly 500 children and were able to give every single child an Arch Book! That means 500 children were able to read about the Gospel. Thanks be to God! Londa and her team encouraged the children to read their Arch Books to their parents or younger siblings. Several children came back the next day and said they had done just that! 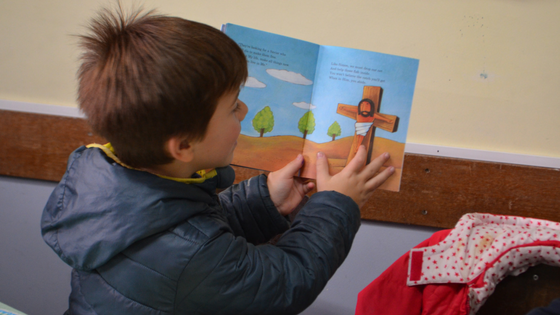 If every one of those 500 children read their book to just one other person in their family, they’d have doubled the reach of the Gospel to 1000 people. Then Londa’s team asked the children to give their Arch Book to a friend after they’d read it—meaning potentially 500 more people got to hear God’s Word! What started out as a small gift to 500 children increased to 1500 people—all through children and their books. People like Londa are able to give Gospel-centered books because of your generous support of Concordia Gospel Outreach. Every donation—every penny, every dollar—means we can give mission teams print books that allow children and adults all over the world to read about the life-saving and life-giving death of Jesus Christ! For many, these books will be the first time they’ve heard the Gospel or even owned a book. We should never underestimate the power of God’s Word to change hearts and lives. When people read the Bible or an Arch Book, the Holy Spirit is at work. Through your donations to Concordia Gospel Outreach, you’re playing an essential role in the salvation of people you’ve never met. Thank you! Your gifts go directly towards Bibles and Bible-based books that are put into the hands of people who have never heard the Gospel. And who knows how many more people will hear the Word of God because of a single copy of the Bible that all started with your donation? Let’s continue to multiply the reach of the Gospel. Every donation, no matter the amount, makes a difference, and every book has the potential to reach countless more people after the one who first received it. Your donation keeps on working long after the book has been sent! I hope you will join us in our pursuit to spread the Gospel to those who have never heard it. The Holy Spirit works in people’s hearts through the Word of God, but that Word gets put into empty hands because of you.